My son asked me the other day, “Mommy, what’s Earth Day?” When I explained it to him (“Well, honey, it’s a day when we celebrate the Earth and try to remember to help keep it healthy”), I felt a little bit ashamed. Without the Earth there is nothing – so why do we only give it one day? On the other hand, Earth Day does give a lot of groups who are fighting for the Earth a platform to get the word out. This past week (Earth Day seems, happily, to be bleeding into Earth Week) there were many actions to draw attention to the US military’s plans for increased presence in the Asia-Pacific region. 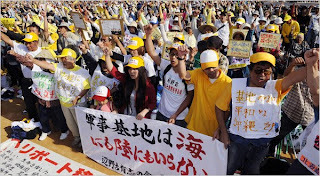 Meanwhile, on Okinawa, nearly 100,000 people turned out to protest the planned relocation of the US military base from Futenma to Henoko (or anywhere else in Okinawa). In South Korea, Catholic fathers held a Peace Missal against proposed construction of a nuclear weapons naval base on Jeju Island. There were also solidarity rallies held in Washington, DC and in Hawaii.